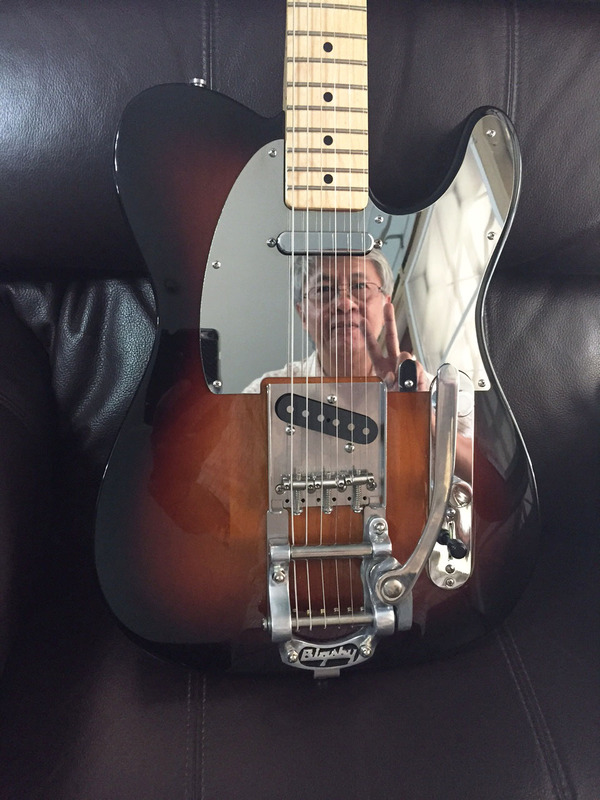 The mirror guard really get along well with other metal parts like the Bigsby vibrato. Full description for my set up is the Bigsby B5 install over the Vibramate plate. No additional hole drilled to my guitar with this setup, just like your pickguard, every hole is perfectly in place. Locked tuners installed and improve a lot of tuning stability for vibrato play. I also change the saddles to titanium since I believed brass saddles did not match my mirror guard. And trust me, titanium sound great. The pickups shown in the picture are Lollar '52T for neck and bridge. I also connected the ground wire to my metal pickguard where the neck pickup installed, more ground plane and better elimination of hiss and hum. Your metal guard is not only good looking, it gave more benefit. Thank you Parankoon for a great photo and the details on a wonderful custom job. I am honoured to contribute to a Tele worthy of a real player's instrument.